Bridal Bindi – A Bridal Bindi is a decorative enhancement of the forehead and the eye brow and is a powerful medium of body decoration, adding definition to the female face. At special events, you have to look your best and the simplest way to do this is by wearing bridal forehead bindis. Our Traditional Indian Bridal Bindis also known as forehead jewelry stand for grace and elegance. 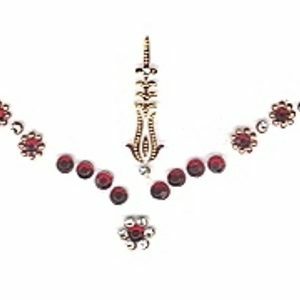 This bindi design is created by using gems, pearls and beads. Bindi is normally worn on the forehead, but can be worn anywhere corner of eyes, upper arm, between the collar bones, on the chest, lower back, ankle. Wear just one bindi or wear multiple bindis at the same time. Bridal Bindi is reusable self-adhesive body decoration and is applied just like a sticker and can be used a few times, once the glue has dried out it can be re-used using eyelash or body glue. The bridal bindi and eyebrow bindi collection is reusable self-adhesive body decoration and is applied just like a sticker and can be used a few times, once the glue has dried out it can be re-used using eyelash or body glue. Our range of temporary body bindis and tattoos is complete, you can have a different design for different occasions.